I have been using this for years and I love it. Any chance of an iwatch app coming for manual data logging? I've got a small roasting business and this is bar-none the best app and tool to do what I do. It'd be great to have a way to also communicate with others in this business and possibly be able to even offer coffee to others. Thanks to the developer! This is a great app!! I home roast with a Hottop roaster which I have added 2, (K-type) thermocouple heat probes through the bean chute. I purchased the Thermoworks BlueTherm which my two probes plug into. The BlueTherm sends the temps via bluetooth to my iPad running Roastmaster to log the two temps as the roast it in progress. This works very well indeed. Also the myriad of features Roastmaster sports. Inventory, cuppings with time stamp, blending. But the roast in progress graph page is outstanding. You can watch delta rate of temp rise, time since first crack, temp projection markers for temps, you can scroll through pervious roasts which will underlie the current roast in progress for comparison. I also have fan and power settings I can add on the fly with a handy pop-up keypad. This keypad also works with no data logging for temps. Tops scores for me. Incredible connivence having my entire coffee world on the iPad. I roast almost every day. I've been roasting coffee for a few months now, first in popcorn poppers and now in a Behmor home roaster. This app seemed like a good addition to my toolset. After having used it for several months, run 40+ roasts through it, logged 30+ cuppings, etc. I'm still finding awesome features! It amazes me how thorough it is. 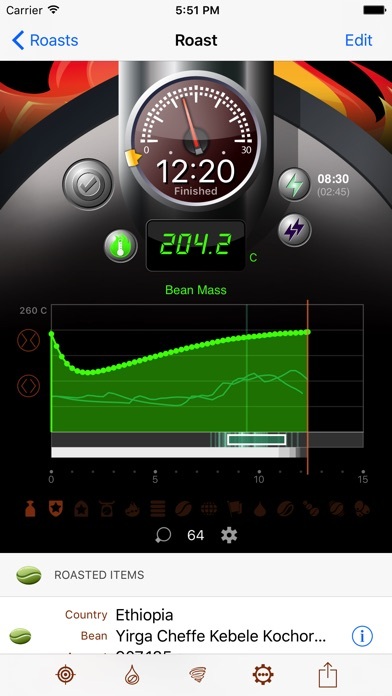 Almost every piece of my roasting/brewing operation can be managed with Roastmaster (the only thing it doesn't have is a brew timer feature – but there are other good apps like Bloom that can give you those features). I have to admit, as a web/user interface designer, I was a bit skeptical about the app's design from the screenshots. After having used it for a while, though, I've fallen in love with the interface. Believe me, it's VERY well done. Most features are very discoverable and for those that aren't, you can browse the voluminous help documents available from within the app. One of my favorite things about this app is the way you can associate everything together. For instance, I can log a cupping and associate it with a specific roast (not just a bean). As I roast, it tracks my green coffee inventory to let me know what I have left "in stock." The relational database model they talk about is super effective and well-implemented here. If you are a hobbyist (or pro) and want to take your roasting up a few notches, buy this app! It's worth every penny. Using this app with Bluetherm Duo and my Ipad while roasting on my Huky 500 makes roasting much more pleasurable. The only trouble is I went with this to avoid buying a laptop for use with another system. But, I found myself competing with my wife for the Ipad. So, I ended up buying another Ipad. Oh, Danny. The new baby is BEEOOTEEFULL! I can't wait to play with all the new toys and gadgets, and . . . Blahblahblah! Nice work again! John Just following up after a few weeks; this latest update is the bomb! A cut above the rest! From the delta projections, to the ability to follow saved profiles with absolute consistency, I can't give enough praise! Great app! All the new features in the active roast console are unbeatable. Best $$ I've spent in a long time! I use this app for all our data logging at my small roasting company! We have it set up for both our production and sample roasting and could not be more pleased. I highly recommend this app to everyone! I've been home roasting for several years. After tracking everything by memory or notes pinned to the bulletin board, Rainfrog's Roastmaster is an absolute treat. Creating blends by percentage, tracking settings and results for each roast, and having the inventory automatically adjust with each roast are all time-savers, and worth the little bit you'll invest in this useful app. If you roast - get it! Simply Stunning! Does everything I could hope for, home roaster gone pro. If you roast- you NEED this ap! UPDATE! I wrote the first review for this app when it was released, and just did my 303rd roast with it. The features just keep getting better! Keep up the good work! Here's my initial review, for grinds and grins! ☕️ I was sitting at home this morning meditating on the full city+ Sumatra I roasted last night thinking, you know, I should make an app that let's you keep track of your roasts, so you can duplicate the art you just created the day before. I, however am not the programming type, so I figured I should see if there was "an app for that". Indeed, there is! This program is a must for any serious roaster. The UI is polished, and shinier than the finish of a French Roast out of the oven. It let's you track what kind of beans you have, how you have roasted them in the past, cupping scores, and stuff I never thought about, in a simple to use way. Now I can stop using my iPhone timer to keep track of what I consider vital information. Keep up the good work! And thanks for nit releasing a half-baked app! This app has its usefulness, but it is not worth the $10 I paid. It has a very non-intuitive feel, and features seem to change with no warning or pattern. Sometimes I am able to compare a current roast profile with a historic one, but then that feature drops out mid-roast. For the cost, I expected much more. This is a wonderful app that has doubled my toast quality and made made roasting coffee even more fun. It is very deep and very customizable. At the same time, it is easy to use even when your in the middle of an intense roast session. I roast with my grill and a drum so I have to manually enter my curves. It is very easy to do and that's not something most roast software devs have accomplished. I also love the variety of data you can enter which makes it perfect for those that take this science/art seriously. There are a few things I'd like to see improved. Mainly, the graph is a bit hard to read. Despite the customizability, it can get very cluttered and the dark background makes it hard to decipher. Here are a few other things in the roast section I personally feel could be better: - Easier to read graphs - Can change minimum temp of graph -- not just 0 - section for moister loss percentage - section for development percentage - section for preheat temp - ability to hide unwanted sections (like agtron or roaster voltage) - it should remember or save curve names and parameters when adding a curve - in the bean inventory, it shouldn't go into the negative numbers. Just 0. Otherwise, this is an amazing app that I'll continue to use as I develop my roasting skills. Great work! Great app. Great customer service in response to questions and suggestons. Cannot wait until this comes out as an ipad app. The hardware portion was a little intimidating, but after installing Phidgets hardware and connecting it to my Diedrich IR-12 it just works. So all I do is use the software and haven't given the HW a second thought. As it should be. Profiling my roasts is automatic now. With the ability to zoom in I can see trouble coming and adjust if necessary. The delta curve tells me more information than just the temp curve. The ability to save roasts as profiles makes repeating a roast much easier. You can even cup and score your roasts in the app. All kinds of features are customizable- the delta curve size, how data is presented in the analyzer, when control points are recorded. I keep learning more about it as I dig deeper. The developer is responsive and genuinely interested in making the app work for all of us, home or biz roaster. The Dropbox integration is nice. I noticed if I pass a database back and forth via Dropbox it sometimes comes up as the old version. This maybe a Dropbox issue, quitting both Dropbox and RM and then sending the database over seems to get it right. My only gripe is that data entry could be simplified. Like sliders for cupping scores, data points that are numbers and such. This app is now an integral part of my roasting day. It's my living. The app has paid for itself and the hardware since day one. Thank you for making my life so much easier and my coffee so much better! I recently upgraded from an air popper to Behmor 1600 Plus for home roasting. I wanted better logging than paper for repeat ability and tracking. This app fits the bill. I've logged a couple dozen roasts and am pleased with the results. The only woefully absent feature is database syncing via iCloud or Dropbox. I don't always have my primary iOS device on hand and would love the ability to log a quick roast using my iPhone. Overall, well recommended. I started using Roastmaster as a hobbyist, and have continued with it as I transitioned into a small business owner/micro-roaster. And this app has performed exceptionally at every step of the way. The developer is a roaster himself, a coffee industry professional, and a talented app developer...and all-around great human! I can't say enough good things about the app and developer. Tip o' the hat! 5 star app, plain and simple. My new favorite feature is 'Copy'. It has saved the day more than once already, and makes entering multiple batches a breeze. 500+ roasts and going strong! Been using this app for a month. I roast for myself, in my home. This app has helped me to become consistent, resulting in better coffee, with a less stressful roasting process. The one time I had a question that I could not find an answer to, my email was answered within hours. The depth of this app is stunning. It has been a useful tool with my ongoing journey to Coffee Nirvana. If you roast coffee, you're cool. If you're cool you will love this app. I have been a Sweet Maria's junkie for a whole bunch of years now, this app is the second most important ingredient in my obsessive hobby. It's easy to jump right in and reap the benefits of this app right away. I'm on my third week now, and it still never ceases to amaze me. Very through, it has bean innovatory , the roaster variables are never ending, this is fully customizable for any set up. For me I track my roasts, rate the cups, know when it's time to order more, it really has become the digital center of my coffee roasting enterprise. Flat out the best money I have spent on my endeavor for perfect coffee. Thanks to the people behind it. Tonight we roasted our 300th roast, it was some Kenya Safari Ridge. We have used this app since July 2010 and the software keeps improving time after time. We can't roast without it now since it tracks our inventory and every single roast detail we want. If you roast coffee for fun or semi pro you should have this app. Big Thanks to the developers, and great work! Forget notecards. I started my coffee roasting journey using this app day 1. I don’t use all the features, but I’ve found the app easy to use, and when I’ve needed support (seldom) it’s been great. $10 is a lot for an App but it’s a no-brainer with this one. Initially I was hesitant to buy the app because of the cost but after making the plunge it was well worth the money. For a home roaster this is your right hand man, logging roasts, a wealth of detailed inputs, logging raw beans, cupping scores, and compatibility with thermometers. There's so much this app provides that replaces a excel sheets and notebooks. If you check the company forum, their customer service (the creator of the app) communicates with you directly and helps you with whatever question you have. Overall, you won't be disappointed if you're tired of tracking your roasts manually! I fully agree that both the app and Danny are extremely helpful. It is really comprehensive in covering so many aspects of roasting coffee. But there is one feature that really brought me back after a year or so of using it, then a couple of years of not using it. It now generates, DURING A ROAST, a curve of any reading or setting that one wishes to time plot. In other words, at any desired moments, one can enter data that are read from any source, and the data will be graphed vs time. That is great for observing the progress of, for instance, beand mass temperature. (But you could also use it to generate a time plot of the outdoor temperature, if you so wished, though I haven't checked for the upper time limit on such a plot.) Some roasters spend a lot of time and money on fully automatic roaster control from their computer. This is for the simpler person like me who wishes to do things more manually, and get a nice 'feel' for things. It is also helps remind those like me who need to do certain manual things during a roast, but sometimes miss because of inattentiveness. I like it! Prior to the update over 800 roasts were logged in our cafe using this app. I was on the verge of abandoning roastmaster and had already installed both artisan and typica on an extra MacBook. The lack of a ROR curve was a primary factor. 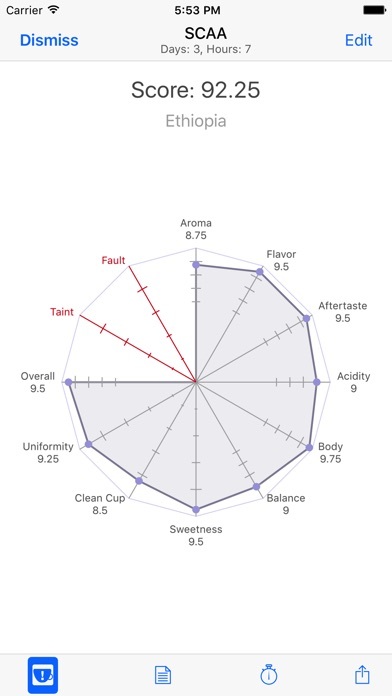 As a novice roaster I can use all of the data possible. Plotting the ROR post roast for analysis was tiresome and less helpful then a live read. This has been addressed. Along with a whole lot more! Expectations of the update were far exceeded. The roast analyzer is insanely rich with features that improve and enrich workflow. Building a profile pre roast is a welcome feature. I'm sure more will be discover as I continue to explore the new functions. For now the iPad/iPhone will continue to handle the bulk of work in the cafe, handling transactions, managing inventory, playing music, running acaia coffee scales and roasting. The one improvement could come from us, the user community. The unused forums at rainfrog could be an amazing place to share knowledge, collaborate and grow in our craft. Roastmaster is a slick, well written app. Hats off to the developer. I've been eying this for weeks, and finally downloaded. I'm just beginning to utilize the power of this program. Looking forward to the updates! I have a Behmor 1600 Plus and was looking for a better roast log than paper. I hopped on iTunes and found this app - wow is all I can say!! It was much more than I hoped for! If you are looking for an easy way to track nearly every variable, look no further. It is very well organized and looks great! Excellently useful and well-thought application to augment the fun and rewards of home-roasting! Worth the $10... which is saying a lot in the world of apps these days. Thank you!! I love this app. It's a great example of what apps can be. Someone spent their time and implemented the very best tools you can imagine for the home roaster. It's totally worth the money and I'm usually skeptical. This app has refined my home roasting and helped take it to a whole new level. Very very thoughtful application, and what great timing as I've just upgraded from hot air popper roaster to behmor 1600. Really, it is extremely well done and well deserving of $10. The commitment shown already will surely continue to use great features in the future. One thing Iight suggest is the ability to create blends by combining beans before the roast. It currently seems to work best for roasting individually and then combining afterward. Great job! This app turned out to be everything that I've ever wanted/needed. I've kept a journal for years outlining all of my roasts and now it's completely obsolete. Funny how technology is slowly creeping into every corner of everyday life. Thank you for creating roastmaster. Best money I've spent on an app since I first got an iPhone three years ago! I use this app often, roasting multiple times a week. It's great for simply tracking your roasts. Timing, first crack, etc. I would like some upgrades though. It would be very useful if it were easier to input data during a roast. I like to make note of when the coffee hits certain temperatures. 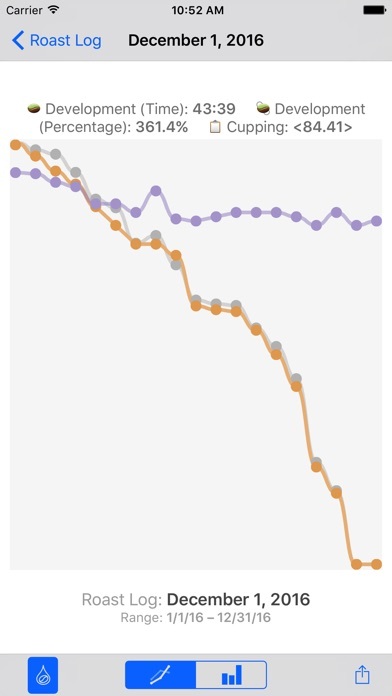 It would also be useful to be able to view and compare roasts graphs post roast. Other than a few improvements this is a great app. This is the most I've paid for an app, but believe it is worth every penny. Very well done. Really takes advantage of the ipad functionality and takes my home roasting to a new level. Now I can throw out my notebook, index cards and spreadsheets and keep all the data in one place. I have never paid more than a buck or two for an app but this one just looked too good and it has delivered big time. I have used paper logs to log all of my roasts up until now. Roastmaster has taken the place of my big 3 ring binder full of logs. No more digging through to see how that last fantastic Burundi was roasted. Just look it up and all the info is there!! With my Gene Cafe, repeating results is easier than ever!! I also love the inventory tracking. Actually, I love every aspect of this app. It was so worth the $$!! Awesome!! When I started down the journey of coffee roasting, I was using traditional paper logs. But I'm an iOS person and I wanted an app to log my roasts. This app is perfect. I'm still digging in to all the customization and info that it can hold and, with every update, it just gets better and better. 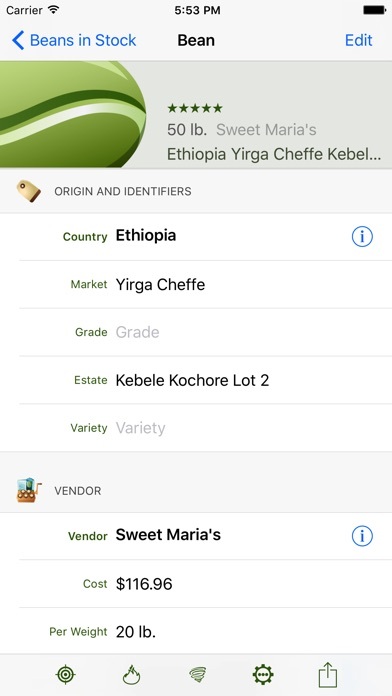 We use this app to manage our inventory, log our roasts, blends, cuppings, etc. The interface is clean and easy to use but the app is super powerful and has a ton of features under the hood. We’ve been manually logging which is easy and intuitive but we are in the process of updating to data logging via thermal probes and wifi. The app developer has been incredibly helpful in setting up our system. We are having a roaster custom built and he has communicated directly with the manufacturer about all the details to insure everything works perfectly. In addition, the developer is active on his site and responds to forum posts and emails quickly and in detail. The app continues to have new features added and just gets better and better. We researched a bunch of other options before deciding to base our entire system around this app and are very happy we did! Really good app for coffee roasting. I really like almost everything about it. The only problem/request that is have is that you let me type in the time for the timer instead of using the frustrating ring slider thing to set the alarm. Great app for recording your roasts. Never had a problem, and I roast at least once a week. Keep up the good work.